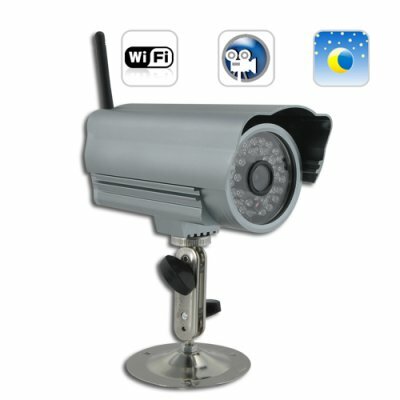 Successfully Added Skynet One - IP Security Camera (WIFI, DVR, Night Vision) to your Shopping Cart. Easy to setup and use. So powerful in what it allows you to do. Feature-rich! The Skynet One - waterproof IP security camera with WIFI, night vision, and DVR functionality! When you can't be there yourself, you can with Skynet One! Powerful Beyond Belief: The Skynet One waterproof IP security camera with WIFI and night vision lets you watch what is going on outside your home or in the alley behind your store, not only while you're safely indoors, but from anywhere on the Internet! With the IP address of the surveillance camera, you can be on a business trip in Tokyo and watch your backyard in Copenhagen. How does it work? Skynet One is connected to the Internet in the same way your house is connected to the road. As long as someone knows your postal address they can drive along highways and streets to find you. In the same way this IP security camera generates a IP address for itself when you connect it to the Internet. With that IP address, you can view and record what the video camera sees from anywhere in the world. All you need is an web connection. Tons of Features: The Skynet One let's you see what's going at home or at work from anywhere in the world, but there's more. It is housed in a rugged anodized aluminum shell which is waterproof so come rain, sleet, snow, you'll see and be able to record the show! What's more, it features streaming VGA quality graphics and can even monitor the environment when there is no ambient light available. Thanks to a 1/4 inch CMOS sensor and 30 infrared lights, you'll be able to see what's going on even in darkness! This IP security camera with interpolated 100 frames per second recording functionality is brought to you by Chinavasion at an astonishing low wholesale factory direct price. Click "Add to Cart" right now and we'll express ship you a sample to enjoy it for yourself. Then when you see how outstanding the quality is, feature it on your online store for some easy and high profit sales for your website. This is an excellent camera. It uses standard CS mount lenses so it can be changed to whatever focal length you want. The camera works perfectly in Zoneminder with the following settings. Very nice product, in all its good at a good price. The camera has an excellent night vision capability that completely astounded me. The manual needs more attention however. Not enough detail is given to where the AVI files are written on the drive. Software is a little cumbersome as well. I have purchased 4 IP cameras to date. What first attracted me was the price of this camera. I ordered several to place around my acreage. The Wifi setup was easier than I thought it would be as well as the software. There is no zoom option, but the viewing distance and quality is way better than I thought it would be for a cheaper camera. Over all I do recommend this as a easy to use, quick setup, and good product.